Choosing the perfect paper gift bags for your corporate event is a challenge! With so many finishing options to choose from, it’s no wonder people get confused and stick to the standard paper bags – which don’t really ‘wow’ anyone. Surprise your event’s attendees with gift bags they’ll never forget by opting for professional paper bag finishing from a bulk paper bag supplier! Below are four of many finishing options you can choose from, each able to take your paper gift bags’ appearance to greater heights of aesthetic appeal! 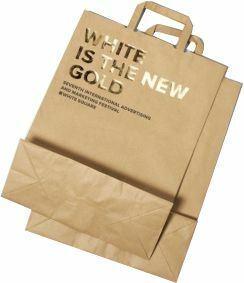 Embossing or debossing are effective paper bag finishing techniques that can really make your brand ‘pop’ on the surface of the paper. Embossing involves raising the surface of the paper bag in a specific pattern, giving it a three-dimensional look against the flat backdrop. Debossing, in contrast, involves creating a deepened pattern (instead of raised) which also creates texture and depth on the paper bag surface. 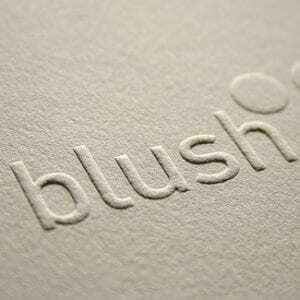 Embossing and debossing are most effective when the patterns embossed are simple, featuring straight lines and little detail – such as brand names and other bodies of short text. Foiling is essential for creating a royal appeal on the side of a paper bag. The paper foiling process involves metal dies and foil film (most commonly gold or silver) which are used to imprint, essentially, foil-like letters or shapes onto a paper surface. 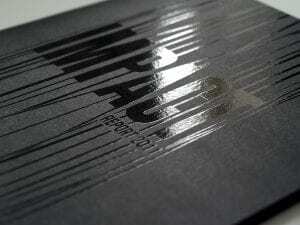 Once your foil design is finalised, metal dies are created with the pattern upon them. These are then heated and pressed onto the paper bag’s side with much pressure – permanently attaching the foil pattern to the paper surface. For maximum aesthetic appeal, many corporate organisations will utilise a combination of embossing and foiling for their corporate event paper gift bags. Paper bag varnishing can be done in one of two ways – either by covering the entire exterior surface of the bag, or by applying spots of varnish in specific patterns. When applying specialised UV varnished patterns (such as branding), printers can either apply ink and then varnish over – or they can simply apply the varnish to the bag’s natural surface. This will make viewing the specific pattern difficult when looking straight on, but will appear when angling the paper bag towards a light source. UV varnishing is applied by coating the paper surface with a layer of varnishing and heated with UV light which dries almost immediately. 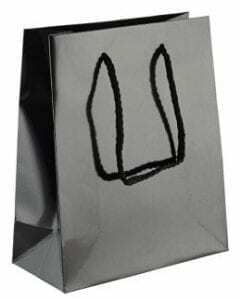 Film laminated paper bags are very popular in the gift bag industry, as shiny gloss paper bags are perfect for holding a gift when you really don’t feel like wrapping it. Film laminated paper bags are completely glossy on the outside, and essentially coat the exterior of the paper bag with an adhesive that is cured to seal ink applied to the paper bag’s surface. This renders the paper bag surface resistant to water and dirt, and the paper bag can be reused multiple times without becoming brittle as is the case with untreated paper bags. Apart from the many paper bag finishes Kikibag is able to apply to your corporate paper gift bags, we also have handle options to compliment your stunning paper bags! We are able to perform all of the above paper bag finishes, and we ensure that the finished product is made to client specifications. Kikibag also offers soft cord handles, petersham tape satin ribbon handles, and cut-out handles to add to the aesthetic appeal of your paper corporate gift bags. 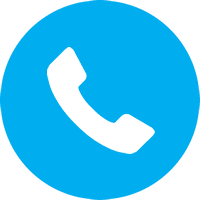 If you’re looking for bulk paper bags in South Africa or the United Kingdom, get in touch with Kikibag today!